Good Chemistry Aurora location has been described as if, “an Apple Store and a Whole Foods had a baby”, and that is exactly what we were aiming for. In developing Good Chemistry’s Aurora location, Good Chemistry CEO and founder Matthew Huron brought together a team of award winning professionals to implement the company’s vision for a groundbreaking retail cannabis experience that is both inviting and informative. “We are creating a world of cannabis in the same way that Apple has created a world of electronics. Apple’s retail environment is designed to showcase the quality of their products. 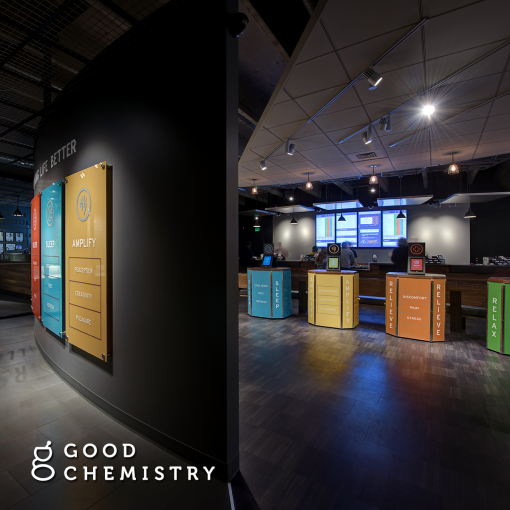 Good Chemistry’s stores are designed to showcase their commitment to the craft of cultivating cannabis products of remarkable quality,” said the designer for the Good Chemistry Aurora location, Tony Coleman. Good Chemistry believes an educated consumer is its best customer. A top priority for the Good Chemistry team is to help customers comfortably explore the world of cannabis and see how it might best fit into their lives – much like the way they shop and learn about other products. The Aurora location launched with Good Chemistry’s pioneering category system, which is divided into four main categories to help consumers decide which sensation they would like to experience: Amplify, Relax, Relieve and Sleep. Good Chemistry has taken flower beyond the traditional thinking of Sativa and Indica and created a way for consumers to navigate the wide range of lift that each individual strain can provide. With the new system in place, Good Chemistry will guide mainstream consumers through the wide world of cannabis. Ingrid and Mr. Good Chem, as well as the highly acclaimed Sour Diesel, Blue Dream, OGer, Durban Poison, and many others all at $30 per 1/8th. Every strain. Every Day.